Elite Cameron, Inc. Windham, ME | Elite Cameron, Inc reports it has recently shipped another slitter rewinder to an American tape manufacturer based in the western US. 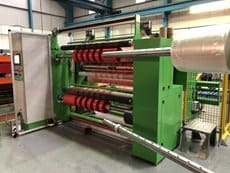 The machine, a CW800 slitter rewinder, was supplied with a shaftless pick-up unwind, score slitting, automatic knife positioning, and duplex cantilevered rewind shafts with unloading posts. McNamee continued to comment on the considerations taken when discussing this machine in the early stages of the project saying that ergonomics and efficiency were two main factors. This lead the machine to be supplied with a shaftless pick-up unwind, unloading posts, and automatic knife setting. Companies interested in more information can contact Elite Cameron USA operations in Maine.